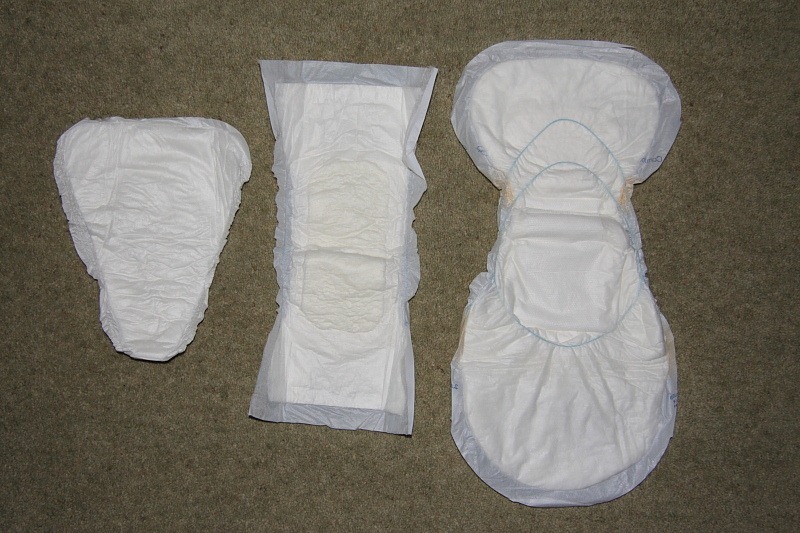 OK, since much of my recent life has revolved around the obtaining and wearing of incontinence pads, I thought it might be instructive to put a little more detail on them. I can hear the cries of “too much information” now. Forge on, brave souls! So, incontinence pads: let’s call them i-Pads for short. After all, typing “incontinence pads” all the time gets tiresome. I was discharged from hospital with a meagre supply of humongous i-Pads which you can see on the right of the photo. These were my generation one i-Pads and, as you might be able to imagine, the gen one i-Pad was not terribly portable. Just look at the size of it! Fortunately, after only a week or so I was able to upgrade to the generation two i-Pad which is in the centre of the picture. Though smaller, it is much less stylish, I think you’ll agree. The gen two i-Pad was decidedly an emergency security release. It was also, I suspect, designed largely with ladies in mind. I say this based upon partly its shape (shape?) but mostly on the fact that it was delivered in fetching pink packaging. Target audience aside, the gen two i-Pad was considerably more portable than gen one and served me well for several weeks. What does that tell you? Finally, despite initial release difficulties at the supplier, I finally procured the much sought after generation three i-Pad seen far left in the photo. As you can tell from the attractive contours, this is very much aimed at a male audience – it must be an i-Pad mano – and is considerably more portable. Furthermore, allied improvements meant that, whereas the original gen one i-Pad had a capacity of a mere 12 hours, the smaller and lighter gen three i-Pad is capable of providing a full 24 hours of capacity. Excellent! Naturally, since all these i-Pads are supposedly portable, a carrying case or skin is required. A couple of typical, suitable cases are shown in the picture on the left. As you can see, these i-Pad cases are available in a variety of colour ways to suit a variety of personal preferences. These are two of the more colourful examples but, for the less adventurous, they are also available in plain grey, white or black. Style-wise there is much less choice – suitable choice, at least. This is because there is much less room for manoeuvre regarding shape since anything too loose would leave, well, far too much room to manoeuvre – if you see what I mean. The i-Pad needs to fit snugly in its case to afford maximum protection. One really doesn’t want to arrive at a destination only to discover that one’s i-Pad has fallen out. Trust me on this. All generations of the i-Pad have featured touch-stream technology. Their chief raison d’être is, of course, to make contact with my stream and absorb it. The same cannot be said for pull-down features. In this regard, both the gen one and gen two i-Pads left a lot to be desired. Neither was equipped with a mechanism to fasten them securely in their carrying case resulting in a loss of service occasionally when the case was pulled down without due care. Fortunately, we engineered a plug-in of our own to fix this bug on site. The plug-in came in the form of a safety-pin and pull down features were thus retrofitted. The gen three i-Pad, on the other hand, has tacky strips to secure it. Lesson learned, clearly. 2 Pings/Trackbacks for "Softwear Releases"